We've had many readers asking us what parts they should keep on hand in case something breaks down. 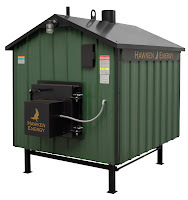 The simple design of the Hawken outdoor wood furnace means that there are very few parts that could actually stop your furnace from operating and these don't go bad very often. Still, there is the occasional problem and we want you to know what items will be handy to keep on hand. It could mean the difference between a warm nights rest and a long cold weekend waiting for a UPS delivery. There are only a few components on a Hawken furnace that could go bad and be hard to find a replacement for quickly. We've put together a package that you can order from our online store. Actually there are two kits. One for the HE-1100 and one for the HE-2100. There are two other parts worth mentioning that could cause some problems with your furnace operation. The 3-way switch on the front of the furnace may fail and keep the furnace from operating properly. This is a normal 3-way switch that can easily be purchased from any hardware store. The other is the pump. A pump failing can put your whole furnace in danger of freezing. Having a spare pump (even a small one) can help avoid big problems. All these parts are available at discounted prices through your local Hawken Energy Rep. Contact your Rep today to purchase back up parts for your furnace or to answer any questions you may have. To find the Rep near you call us at 888-564-2876.